Once there was a little girl who watered a banana tree everyday. One day a voice came from the tree, "Will you play with me?" The girl was very scared and ran to her mother. Her mother said, "Don't be afraid, that voice is of the banana tree goddess, Laxmi. She is pleased with you." The next day when the girl went to the tree Laxmi played with her. Later, Laxmi said, "I live in this tree. Will you come to my house for lunch?" Then through the hollow of the tree she took her to a beautiful palace and gave her delicious food in utensils made of gold and silver. When the little girl returned and told her mother what had happened, the mother was very happy and said, "Invite Laxmi to our home tomorrow for lunch." The girl said , "But mother , we are so poor and our hut is small. All our utensils are broken and our clothes are old. How can I invite her here?" Her mother said "Don't worry , she would be very happy with our love and courtesy." The next day the little girl brought Laxmi with her. As soon as Laxmi entered the small hut, it turned into a beautiful house. The utensils in which the food was served turned into gold utensils. Their old clothes became new. 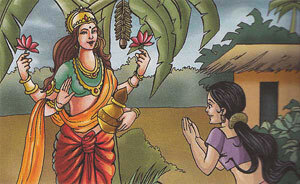 The girl's mother asked Laxmi to stay in the house with them forever. Laxmi said that her blessings would be on their home as long as they worked hard and watered the banana tree. Saying so, she went back to the tree. The little girl watered the tree everyday and they lived happily ever after.